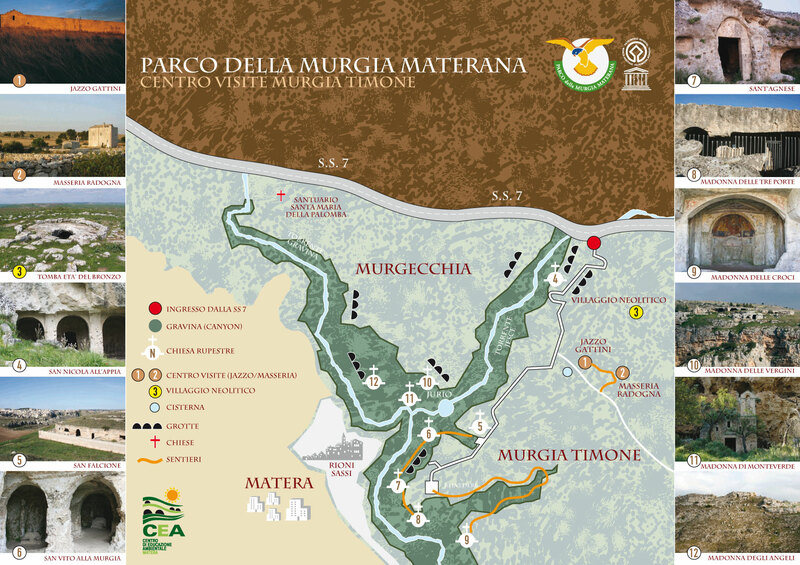 The Jazz Kitten visitor center is the ideal starting point for tours of Murgia Timone, scenic area in front of the Sassi of Matera, very representative of the entire protected area. Area that includes a spectacular section of the canyon of Gravina di Matera caught a number of cave churches. By Jazzo Kittens every day leave some guided tours that you can join being reserved by phone at 0835/332262 or write an email to info@ceamatera.it and saving in this way costs. To have a ’ idea of beauty of the paths read Dichiarazione d’Amore a Matera written by Antonio Moresco, Walker and writer. The fees include: guide service, ticket for access to rock churches, insurance, VAT, video projection of the Park.